Annie was rescued as an orphan in August 2005 from the Halifax River near Port Orange, Florida. At the time, she was just a little over four feet in length and weighed only 70 pounds. Newborn manatee calves are generally about four feet long and weigh about 65 pounds, so Annie was too young to be on her own. She was taken to SeaWorld Orlando for care and rehabilitation. Both Annie and Rocket were “tagged” when they were released, so researchers could monitor them and make sure they were acclimating successfully back into the wild. The tag they wore consists of a belt that fits around the base of the manatee’s tail, and a tether that is attached to a floating transmitter. 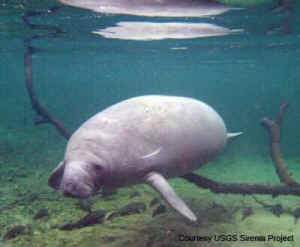 Signals sent from the transmitter are received by satellites and analyzed to get accurate location data on the manatees. Rocket and Annie did well after they were released except for one incident. Two days before they were due for a health check, someone cut their tags off, and the tags were recovered in nearby Lake Beresford. About that time, Annie and Rocket stopped coming in for visits to Blue Spring, which was worrisome. But after two and a half weeks, they appeared at the park again, and Annie was easily fitted with another tag. Since that time, both Annie and Rocket have had their tags removed, and their release has been deemed a success. They have returned each year to winter at Blue Spring State Park, although by now, they have gone their separate ways. When Annie turned seven years old in 2012, she became pregnant with her first calf, and she also became part of the Club’s Adopt-A-Manatee program. 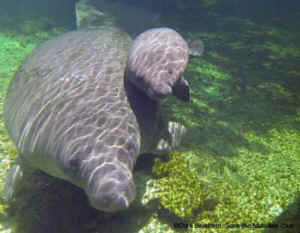 “Annie is very pregnant,” wrote Wayne Hartley, the Club’s Manatee Specialist, in March 2012. “Every time I see her I look for a calf or hope she would roll and show she was still pregnant. She better bring us a calf next season!” Annie did better than that, stopping by Blue Spring in June of 2012 to show off her very first calf, a male later named Arron. Annie is not shy, and she became a favorite with Blue Spring visitors when she was first released, as she was known for hanging around the people-populated parts of the park. Because of her tag, she was very easy to spot. After becoming pregnant, however, Annie seemed to have lost her interest in people and became more focused on her calf. She still kept making visits to the park, however, and Annie was named “Attendance Champion” when she and Arron visited Blue Spring for the 2012 – 2013 winter season. They made a total of 26 recorded visits from October through March. During the 2013 – 2014 manatee season, Annie spent less time at Blue Spring, showing up late for the season in mid-January and making only four recorded visits. Arron, her weaned calf, even made an appearance before she did. “No attendance championship for her this season!” wrote Wayne. But he was pleased nonetheless to discover her on January 19th: “The first manatee I found was Annie!” he wrote. “Wherever she has been, she has taken care of herself. Annie is fat with no new scars.” There was a reason why Annie was so plump. Once again, she made a summer visit, coming into the park hugely pregnant on July 25, 2014. That night she gave birth to her second calf -- a female -- and stayed in the sanctuary of the park for about a week while Club volunteers helped to keep watch over the pair. Then Annie and her calf left to explore other waters for the remainder of the summer and fall. It is still warm in Florida, but when the weather cools down, we are looking forward to seeing Annie and her new calf again this season. We hope she doesn’t keep us waiting too long this time! You can watch for Annie and her calf on the Blue Spring web cams, but in the meantime, enjoy some video below that was taken during her July visit to Blue Spring. Be sure to check our Blue Spring webcams at www.manatv.org and get Wayne Hartley's Manatee Updates for the latest Annie news.